Picture by Loren Dougan/Fairfax NZ. 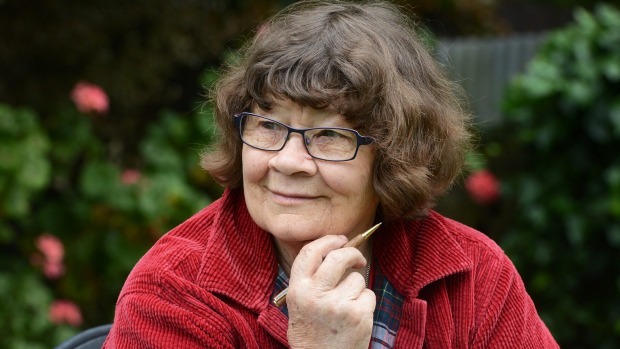 Joy Cowley talks about the 30-day silent retreat she just completed in Wellington. I spend time in solitude in my garden. There is something exciting about the rhythm of plants living, rooting, shedding and flowering. I also paint to get my inspiration to write. I was commenting on MilliThom’s blog today and thought, how many times have I spent trying to create stories and even artwork, when my heart was not in it. Sometimes, shutting down and walking away or diverting my mind to something else helps me come back to story-telling and the story gets even better. I have set a goal to blog each day. On top of that, I am writing my memoir and a collection of short stories. I also write magazine articles which I have not done in a while. Daily chores and the day job takes a lot of that time and numbs the brain. My mind has to travel and seek new things to write about all the time so I read too. When my brain slows down and I become forgetful, I go to the garden and start again. There is a meditation place in Brisbane my cousin and I had once discussed going to for a week of silence and meditation. I cannot imagine how one month of silence would be like, although, I have spent a lot of days on my own when my sons have been away. I do speak with the animals so it is not complete silence. Being in complete silence for one month would be quite an achievement, especially when you are around people, eating and sitting with them and even looking at them. I think people who choose to live alone or live away from others, being in silence for a long time would seem quite normal. Here is a story about a writer who finds her own way to “sharpen” her brain through silence in an old tradition. In a suburban Wellington dining room 10 people sit silently. Condiments pass across the table at the raising of an eyebrow or flick of a finger. One diner sees a neighbouring table’s empty water jug and rises quietly to fill it. A mix of religious and non-religious, the group had never met until a month ago. Most of them had never visited this place. Now, 30 days later, they share a close connection but can scarcely remember the sound of each other’s voices. When their voice boxes are finally awoken after a month of disuse, one man declares “silence has become my friend”. Another calls it the most radical experience of her life. After a hugely busy year, writer Dame Joy Cowley was feeling “about as sharp as a wet cornflake”. So she switched on her email out-of-office – and disappeared for a month. But her email bounce-back message wasn’t the Rarotonga beach break brag. “Terry and I will be on a silent retreat from Nov 2 to Dec 7. We will not have internet contact at this time. Joy,” was the message. For a month Cowley and her husband lived at Island Bay’s Home of Compassion, which functions as an urban monastery. The mission was rest, renewal and reflection, in the oldest tradition of the Catholic Church. The twist was that it all had to be achieved in complete silence, save for a 15-minute daily chat with a spiritual director. For Cowley, spirituality and creativity are inextricable. She already wakes at 4am every day to savour half an hour of quiet before the emails begin and the phone starts ringing. But even for her, spending an entire month in silence was hard work. Cowley and Terry were two of a group of 10 who came from around the country to the retreat. Some were religious, others were not. They had three days of orientation to get to know each other and the home’s glorious garden setting, before stilling their vocal chords and beginning 30 days of exercises in reflection. To read more, click on the link below. How nice of you to comment Nomzi. Thank you so much. It means a lot to me. You have a great week too. This sounds fascinating. I’d love to try it. I too am inspired by nature — it is in constant movement, sometimes life and death situations, yet the world continues on. I think many answers are there, in nature. They (answers) come when we sit and listen. Thank you so much for commenting Dennis. I am glad you like this post. I never cease to be amazed and impressed by the variety and depth of your posts. You certainly are a wonderfully versatile blogger and also an inspirational one. This post is so thought-provoking. The daily activities of life can get to us all, at times, and somewhere to retreat to, and live in silence for a while, sounds both blissful and beneficial. The mind needs peace and rest at times as much as does the rest of the body. Unforunately, the pace of modern life often does not allow for it. Your own life is so jam-packed, Joycelin. Do take care of yourself. very interesting to read for me. I’ll have a 10 days silent retreat at easter this year and I have no idea what to expect. Oh lovely!. I look forward to hearing the music you will create after. 🙂 Thank you for stopping by Jens.